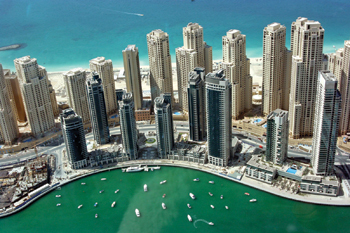 Jumeirah Beach Residence ... supplied to by Kale. KALESERAMİK, one of Turkey’s largest ceramic tile and sanitary materials producers, has set itself a target for the New Year: to expand its horizons in the AMEA (Africa, Middle East and Asia) region’s project market. Kaleseramik has completed several projects in Saudi Arabia, the UAE, Qatar and Bahrain including the Jumeirah Beach Residence (JBR) and Mirdiff City in the emirates. Its plans for the region include increasing the number of its local showrooms to reach end-users on the one hand, and on the other, exerting concerted efforts to grab a share in large-scale projects, in collaboration with Turkish and foreign construction companies operating in the region. “We aims to do this by taking advantage of our wide product range and production facilities in Italy that produced sanitary ware and bathroom furniture, apart from ceramic tiles,” says Tangoren. Kaleseramik has completed many renowned and signature projects in Turkey and other countries, including hotels, shopping malls, airports, subways, social housing and sports complexes. Tangoren says Kaleseramik now has all the necessary tools and experience in the projects field. Kaleseramik is among the world’s largest ceramics manufactures in a single field with a production capacity of 66 million sq m per year. It has 50 factories in Çan, Turkey, which have a yearly production capacity of 27.5 million sq m for wall tiles, 32 million sq m for floor tiles and 6.5 million sq m for granite ceramics, as well as the capacity to produce 15.000 tonnes of insulator and 40,000 tonnes of frit. Its factory in Yozgat has a capacity to produce 3.6 million sq m of floor tiles per year. Kaleseramik produces 1,900 varieties of floor tiles in 50 different dimensions and 2,200 varieties of wall tiles in 60 different dimensions. It offers approximately 200 new products to its customers every year.